Our first math block of the year brought the world of numbers to the first graders in a qualitative way. We began with hearing a story about a woodland Fairy Queen who was looking for the numbers in nature. Many of the fairy folk went out into the world to search for the number one. What is there only one of in the world? Finally we found answers – there is only one sun, one earth, one me. 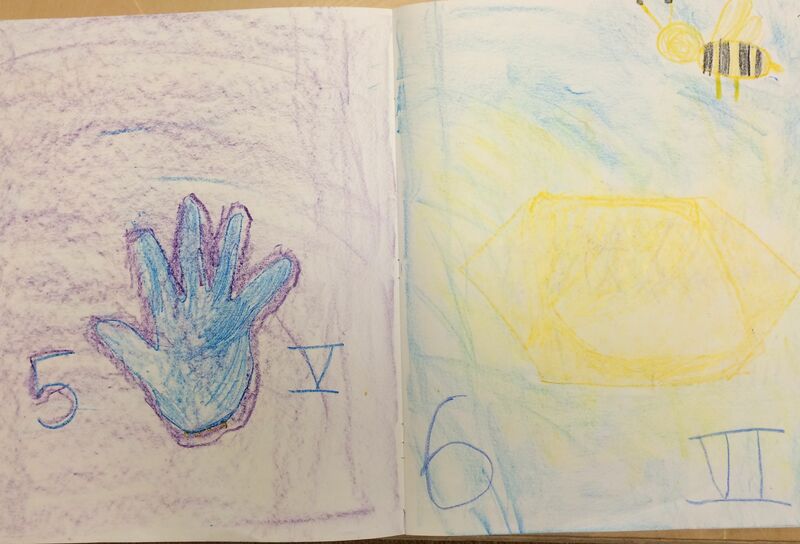 We drew a picture in our main lesson books of the sun and wrote the number one. 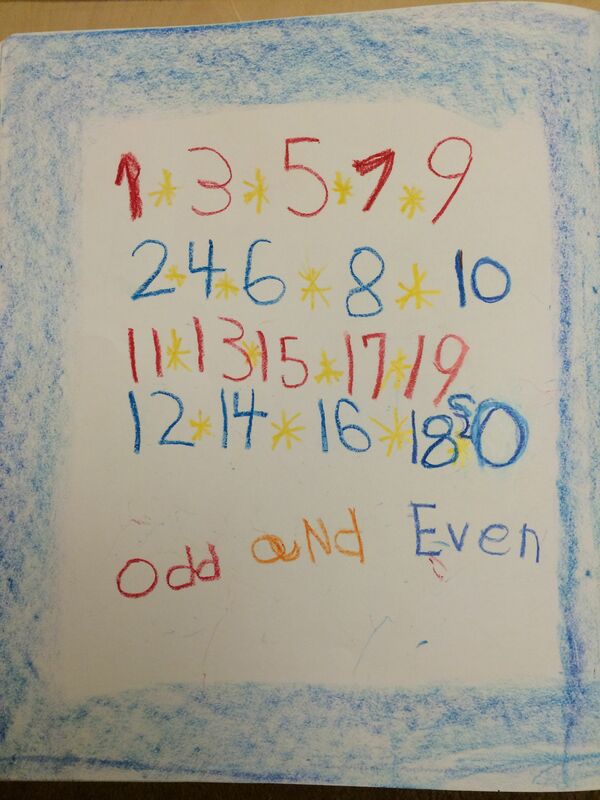 Each number 1 through 10 followed the same pattern. Throughout this block we also worked extensively with manipulatives in all four operations. We counted and counted and counted until our voice coincided with the movement of our fingers and feet, and still we need practice with our rhythmic steps. We counted by 1’s, 2’s, 5’s, 10’s, and 3’s. We did this with bean bags, hand clapping, stomping, and stepping. We counted backwards too! We learned to count on our fingers when told simple word problems and we practiced magic with our fingers and with manipulatives. We work on seeing quantity without having to count, so I would hide my hand under a silk, put up four fingers, and then yank the scarf off. Then the children would shout as quickly as they could, “Four!” We also did this with acorns and gems – so simple, but great fun. We worked on regrouping numbers with acorns, gems, and other items in the room as well. For example, after learning the number 8, I would say, “Please go and find 8 of something in the room.” The children would come back with 8 blocks, 8 bean bags, or 8 books in a pile. We would count them and then I’d say, “Show me another way to make 8.” Then they would rearrange their items into piles of 4 and 4 or 2 and 2 and 2 and 2 or 5 and 3. We saw the many ways we could make the number 8! 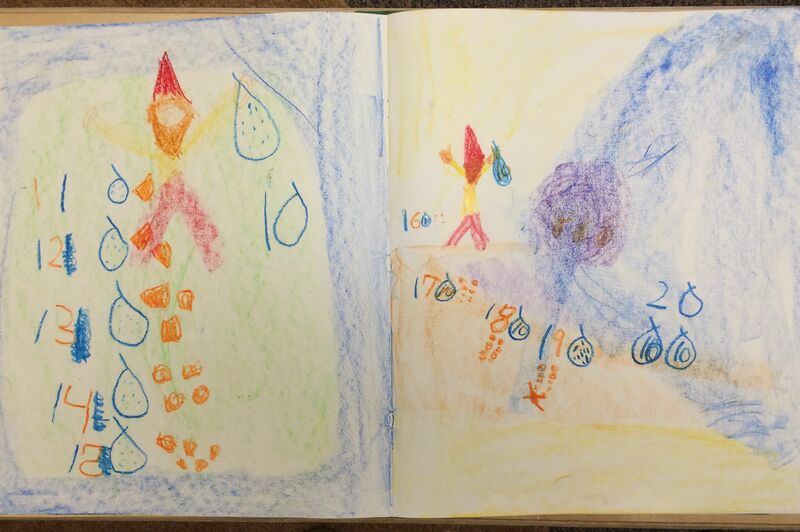 After learning numbers 1 to 10 (in roman numerals too) we heard a story of gnomes who mine jewels for their king, and their king wants to know exactly how many jewels are mined each day, so the gnomes have to be careful counters. They put 10 jewels into a bag, and so then we were counting by 10s! When they have 10 jewels and a few extra, the gnomes learned how to write these numbers, and so we learned to write numbers 11 through 20. We did all of this with gems and small bags, so the children were counting up their 10 jewels and putting them in bags and then putting drawings into their main lesson books. After all of this, we revisited numbers 1 to 10 and paired them up. We paired ourselves up and played an even and odd game, learning that even numbers have partners and odd numbers are left alone. We discovered that when we count by 2s, all of these numbers are even! Second grade began the block reviewing some of the important ideas from last year. 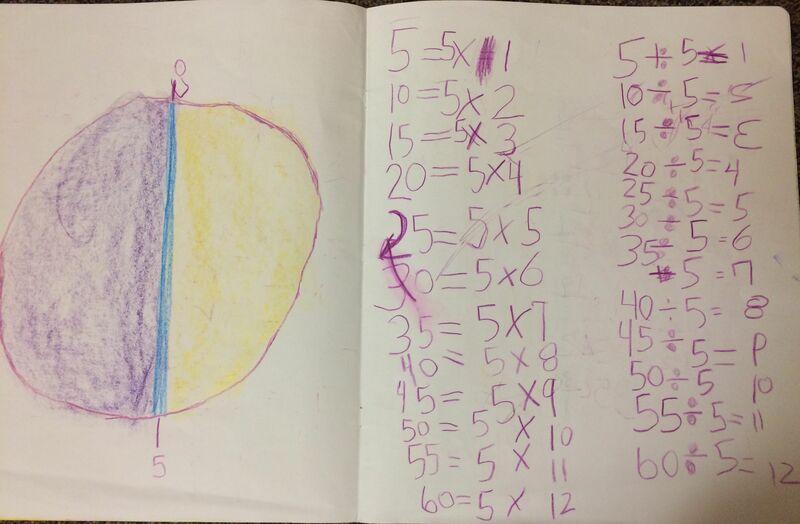 Each day they began with math practice, which involved copying a few math problems from the board into their books and finishing them. This happened while I was teaching the 1st graders their main lesson. 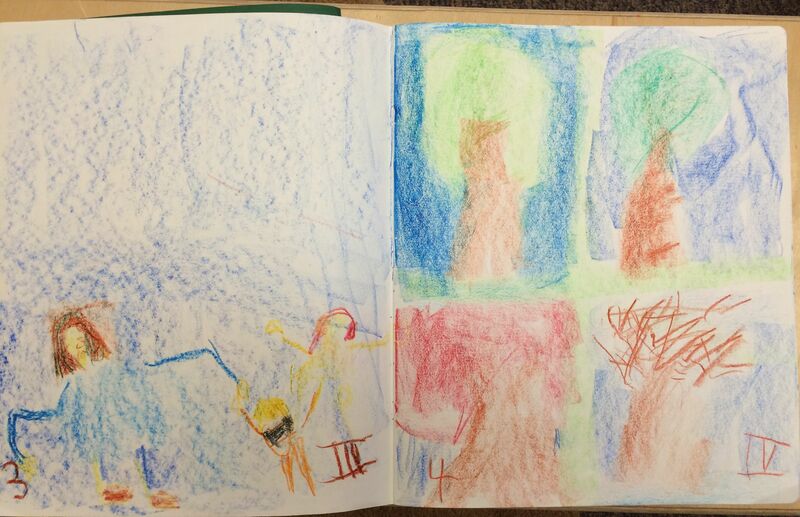 At first it was difficult for 2nd grade to focus while I taught, but gradually they completed their work more quickly. 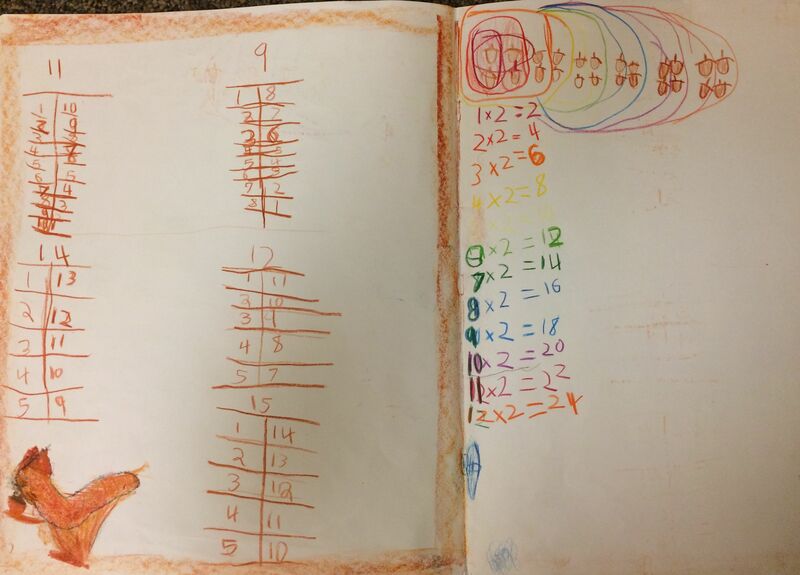 We reviewed the four operations from last year – addition, subtraction, multiplication, and division. We also reviewed regrouping, both with manipulatives and on paper. Then we dove right into our multiplication tables, starting with the 2s. Pulling from the story I told last year about Squirrel Nutkin who regrouped numbers, this year he grouped them in piles of two. We showed how one group of two was the same as 1×2 and how two groups of two was the same as 2×2 and so on. We played with lots of acorns and drew lots of acorns to begin to understand this concept. 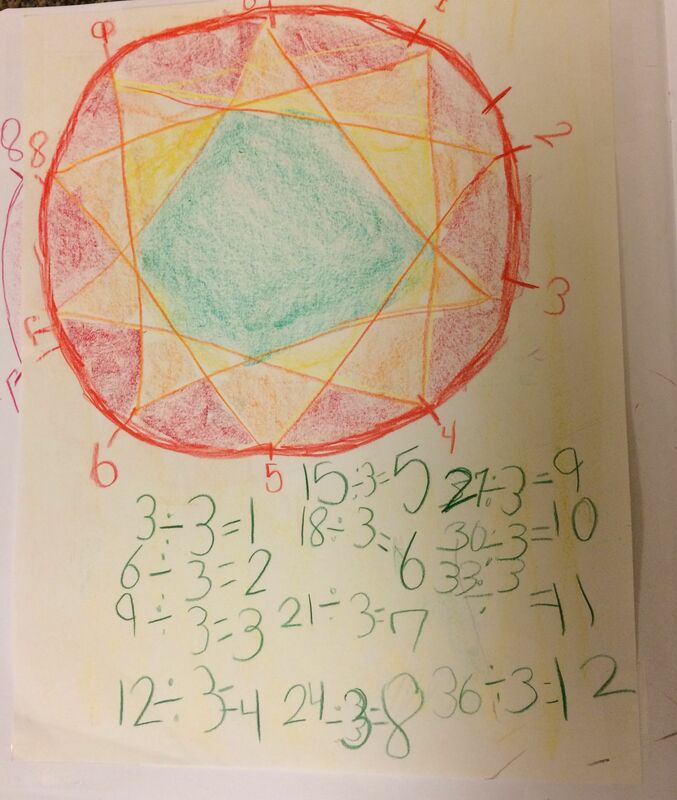 Then we worked in geometric shapes formed from a numbered circle, creating beautiful patterns from our 2 times table. We created this shape on the ground with numbers and yarn (sometimes with first grade help) and then drew it on the board before putting it into our main lesson books. I repeated this process with the 3 times table and 5 times table and then reviewed the concept but emphasized division. We looked at four math problems: 3×4=12, 4×3=12, 12/3=4, and 12/4=3. We showed with manipulatives just exactly what these written problems mean. Next we moved into work on place value. Expanding on a story from last year about gnomes mining jewels for their king, these gnomes carried bags of 10 gems out of the mine. Once they had 10 bags of 10 gems each, they put them into a wheelbarrow, so each wheelbarrow contained 100 gems. 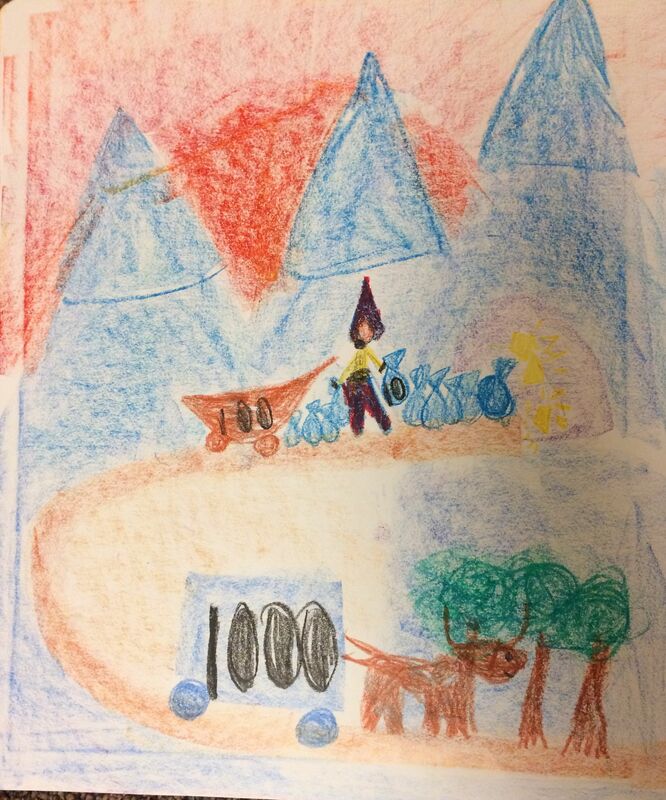 Then 10 wheelbarrows were dumped into an ox cart, which contained 1000 gems. Yes, we actually counted out over 1000 gems one day simulating this story. We used small bags, paper cups, and a basket to represent the bags, wheelbarrow and ox cart. After telling this story, we worked with the concept for a number of days. 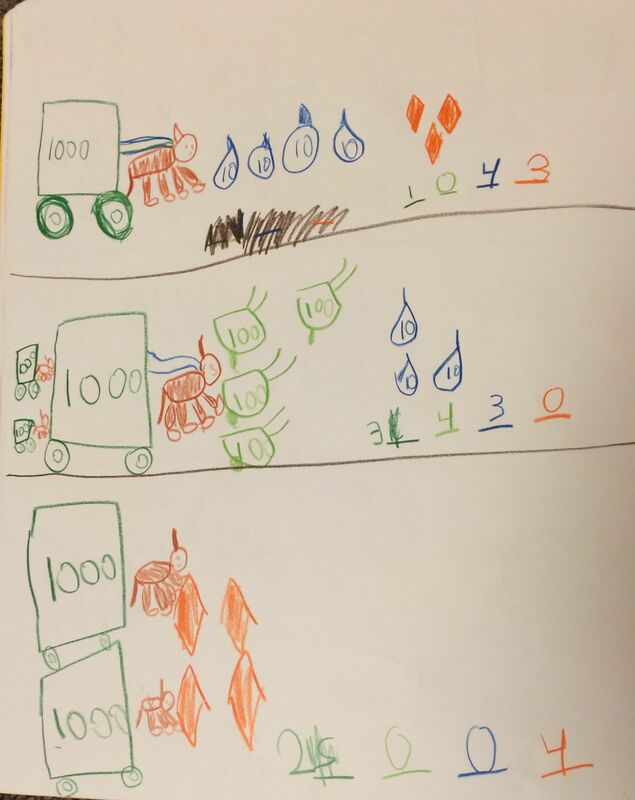 Eventually I was drawing ox carts, wheelbarrow, and bags on the board and the 2nd graders could tell me exactly how many jewels the gnomes had mined. For example, 1 ox cart, 2 wheelbarrows, 5 bags, and 3 extra jewels = 1253 jewels! We used color coating in our writing to show the ones, tens, hundreds, and thousands, and we worked on reading these numbers aloud. After this work, we spent a few days helping the gnomes count jewels from bags that had been dropped. So we found strategies for adding higher numbers after we reviewed addition with lower numbers. Then we reviewed our entire math block. 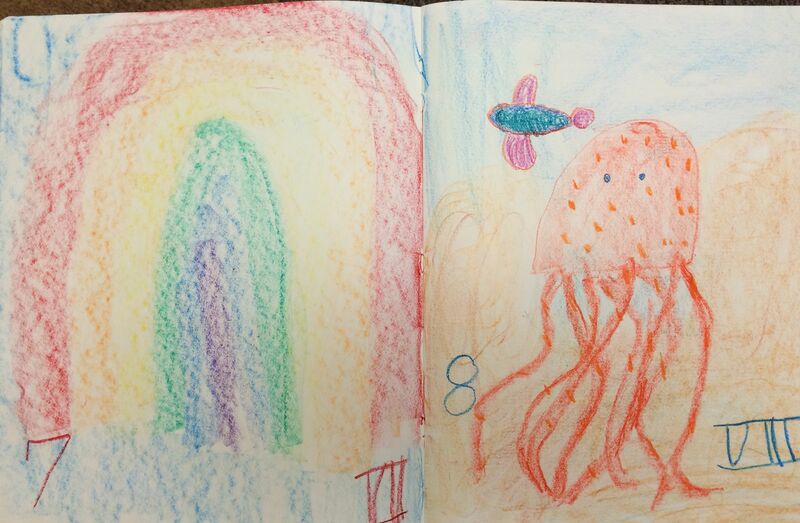 Our class continues to work with color and explore the mood of color. After many days of rain, the sun came out so we painted this feeling with deep purples and then shining gold. We also painted the warm colors of fall – gold, lemon yellow, vermillion, and carmine red. 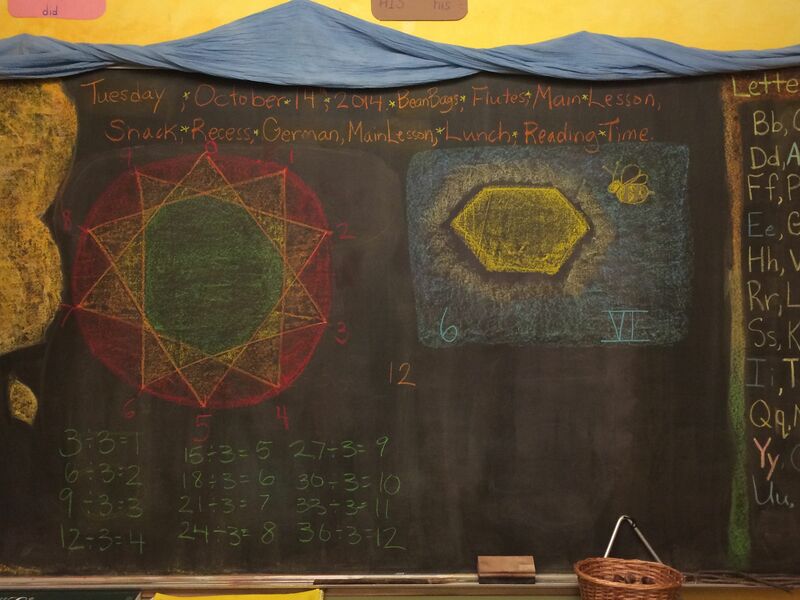 We painted less in this block for the sake of covering more math. At the end of our Monday through Wednesdays we have 30 minutes of reading time. I have created two groups and I alternate working with them each day. With one group I am reading a simple chapter book called, “The Secret Pet.” We read aloud and sometimes talk about reading strategies if we come to a word we don’t know. With the other group we are reviewing the letters we’ve learned and their sounds. I have made index cards with our letters and the images our letter came from. We use these cards to play simple word games. For example, each student has an index card with an “E” on it. They have to choose two more letters (all consonants) to put on each side of their “E” and then we all try to sound it out. It is so exciting when we make a real word! Autumn is coming to town.